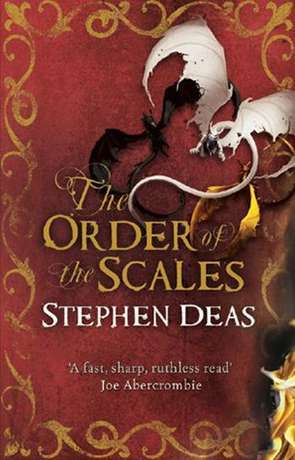 The third of Stephen Deas’ series, published in 2011, The Order of the Scales continues the story of the Dragon Realms. Each book picks up immediately from where the last left off, solving the requisite cliff hanger with yet more twists and turns of scheming between the kings, queens, princes, dragons, alchemists and blood mages battling for power. The titles of Deas’ series are a little bit arbitrary. Each is a feature of the book, but not as prominently so as you might imagine. More attention is paid to the gradually unravelling society of the realms as the plot twists and turns. Writing a fantasy epic that continues straight on from book to book is incredibly difficult, particularly when the locations and characters are revisited. The former can be tricky to re-describe without slowing down the narrative and the latter have to be shaped by events. There is a little roughness to the shifts of the characters at times. Hyrkallan and Kemir both undergo shifts in attitude between The King of the Crags and The Order of the Scales, although in the case of Hyrkallan, this might seem more noticeable owing to the other narrative perspectives being employed around him. With Kemir, the change to bitter irritant in the first third of The Order of the Scales is more pronounced when compared to his previous persona. However his resulting change of circumstances’ also allows Deas to explore the lower tiers of his Dragon Realms’ society and as the book moves on, to spend more time journeying through its landscape. These are where The Order of the Scales brings an added dimension to the series, breathing life into a world which gradually evolves from being a series of locations into something more picturesque. Echoes of Melanie Rawn’s early (and best) work are starting to emerge alongside the more obvious comparisons to Mccaffrey’s Pern. The political scheming set up in the first book and played out through one iteration in the second is now in full flow, transitioning into a high stakes game with more and more put on the table as each player seeks to deliver a killing blow. This is War of the Roses compressed into days and weeks, but with a savage difference. The hubris of Deas’ human nobles is to continually underestimate their oppressed and drugged dragons they rely on to enforce their will; slowly but surely their control is slipping away and we see it play out by inches in this third instalment. There is a continual use of italic thought tracking in the writing and this gets quite long in places, slowing the pace of the story. When this has been more restrained in the previous novels it’s been better. Deas also uses this to denote dragon telepathy conversations and the blend of each makes for an interesting depiction of how the creatures can intrude on the thoughts of his characters. The Order of the Scales also hosts the most epic dragon battle I have ever had the fortune to read. Richard A. Knaak’s Legend of Huma pales by comparison as Deas delves into the gritty and terrifying rollercoaster of what such an event might be like. The aftermath is similarly devastating as we know the potions that keep the dragons docile are running out. Each scene of ruin is made more poignant by knowing the homeless and suffering are surrounded by beasts that may turn on them at any moment. The conclusion when it comes has been set up for three books. The wreckage of the realms and the spill of destruction beyond akin to watching an epidemic gather pace. Deas has established and butchered his cast for these three books. Where he can go next will be intriguing to find out. Written on 18th September 2015 by Allen Stroud.